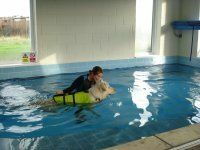 Hydrotherapy is used as a complement to your dog's veterinary treatment and/or exercise programme using the unique properties of water at the optimum temperature, in safe and controlled conditions, and under the direction of a fully trained and registered Canine Hydrotherapist. Pool exercise encourages limb, muscle and joint use, reducing weight load on joints and limbs whilst encouraging a full range of motion. Swimming helps to improves cardio-vascular strength and blood circulation and enables less mobile dogs to exercise more freely, helping to maintain or increase muscle tone and reduce swelling. Swimming in a heated pool is an ideal way to help improve fitness for dogs with joint problems such as osteoarthritis or hip dysplasia; or it can be used to help speed recovery following spinal or orthopaedic surgery such as cruciate repair or hip procedures. Relieve pain, inflammation, arthritis and stiffness. Help recovery following orthopaedic surgery e.g Hip and elbow dysplasia, spinal injury, fractures and sprains. Working dogs and Canine athletes such as or those competing in Agility, Flyball, Racing or Cani-cross can benefit from the use of the resistance jets to improve cardio-vascular and muscle strength. Older or less mobile dogs can enjoy exercise freely with no pressure on limbs or joints due to the buoyancy of the water, and can enjoy a game of fetch with a toy, whilst preventing muscle loss caused by inactivity. Click here to find out more about how swimming can help your dog.